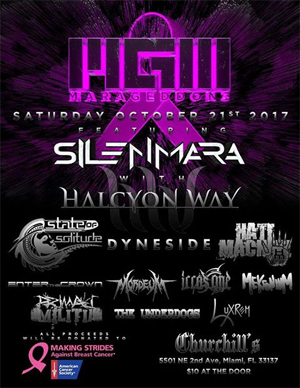 Atlanta, Georgia based metallers HALCYON WAY will be co-headlining Marageddon III festival, taking place on October 21st in Miami, Florida! All proceeds from the show go to Making Strides Against Breast Cancer. "We are stoked to be co-headlining Marageddon III in Miami, FL on October 21st with our great friends in SILENMARA. All proceeds from the show go to Making Strides Against Breast Cancer. Be there, this is a killer lineup!" Marageddon III event page HERE. As previously announced, HALCYON WAY are confirmed, as Main Support, for ANGRA‘s Omni World Tour 2018, alongside OPERATION:MINDCRIME, kicking off on March 22nd in Belgium! Check out below the full list of tour shows.